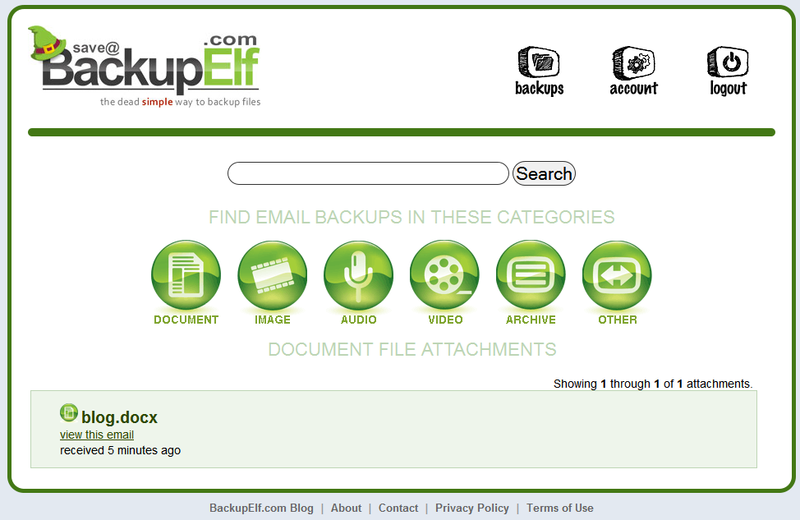 I am not sure if there is any other such easy to use online backup service like the BackupElf.com. Easy to use interface is the most important for people who don’t have any advanced skills in the work on computer. But all these beginners know how to send the e-mail. So, based on this model, the BackupElf.com has to be successful. How to backup online with BackupElf.com? At first, point your browser to the backupelf.com website. Create your new account and select the backup plan you would like to use. The Free plan offers you 100 MB storage, the paid backup plans differs from 1GB to 10GB storage and from $4.95 to $19.95 per month. During the registration process you provide your e-mail address. This is very important – the e-mail address you provided will be the key to move the files and e-mails to your backup storage. After you click the activation link in the confirmation e-mail, you are ready to log in and start using the BackupElf. It’s simple – send any e-mail to Save@BackupElf.com for the address you provided during the registration. The service will recognize it and will save the e-mail attachments to your online backup storage. Moreover, it also will save your e-mail’s body. When I send my first file to this online backup storage, it took about half a minute to appear in the BackupElf.com administration. Also, it sent me the confirmation e-mail telling me the backup was received. When you log in to the BackupElf.com administration, you will see how many e-mails you have backed up and the recent files which were attached to the e-mails. The database is searchable; you can search by the file name not by the content of the documents. You can also filter the files by categories – documents, images, audio, video, archive or other. Each file has a link to its e-mail message, so you can see it like in your mailbox. And, of course, the file can be downloaded. 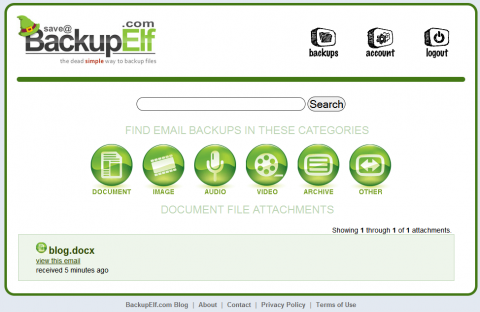 The BackupElf.com is online backup service for all your devices you can send e-mail from. It enables you to backup PCs, iPad, smartphones and any other hardware with internet connection and mail client. It extremely easy to use and I recommend it especially for the beginners.